Full details, files, extras at 3D Printing Projects Page. All three of these starter kits include everything you need to add 3D printing to your workshop. 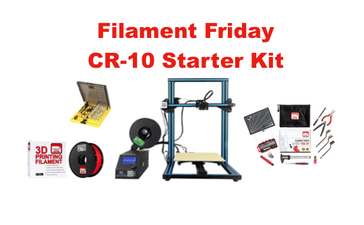 The Filament Friday Tool kit, Filament Friday Filament and the Precision Screwdriver set all the same for all kits. The only difference is the size of printer you want to own. These are Amazon.com kits. All you need to do is click on the kit you want then when the product page appears, click on the "Buy all on Amazon" button and you will be taken to Amazon.com ready for you to add these to your shopping cart with one click. All components are Prime Shipping. 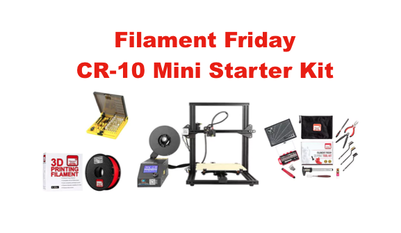 The Filament Friday channel gets a small royalty when you purchase a starter kit. We don't make you pay more. So if you are shopping for that perfect 3D Printing Starter Kit for Christmas, Birthday or just want to buy one, check out these awesome Starter Kits and get 3D Printing Today!